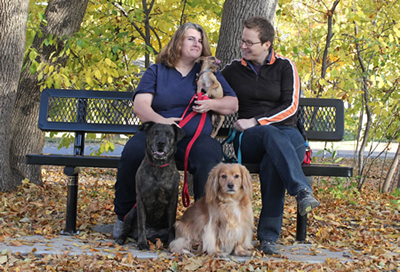 With a combined 26 years of dog training experience, Carly Shivers and Sara Thompson didn’t start training dogs together until 2006 when they both began mentoring with Aimee Sadler, then Director of Training & Behavior Modification at Longmont Humane Society. Though they immediately knew they’d hit the jackpot with Aimee’s experience and knowledge of animal behavior (and her willingness to teach others), they had no idea then that seven years of friendship, collaboration, and thousands of dog training experiences would lead to working together at High Drive Dog Company. 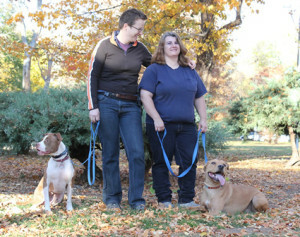 For both Carly and Sara, their paths to training dogs professionally began on personal levels as matters of the heart. 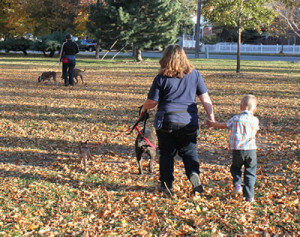 Carly’s path started in Oakland, CA in 2002 when she witnessed a 7 week old puppy tossed from a car. Dirty, bleeding, and scared, that 7 week old puppy – named Pig and now a happy, healthy, almost 11 year old sassy lady – would be the start of it all for Carly. At 14 weeks old, Pig, who had been such a lovely puppy for seven weeks, transformed into a little terror, barking incessantly and sinking her sharp puppy teeth into everyone’s ankles whenever they moved, reducing the household to tears. Carly and Pig were lucky enough to start working with a good trainer who quickly helped correct this problem and laid a foundation for Pig to be a better companion with her humans. Carly will never forget what it felt like to have a dog she loved but wasn’t sure she could live with and the difference a trainer with experience and knowledge can make in helping folks reach a balance in living together with their dogs – and that is what fuels her passion in working with dogs and their people. In the years that followed Carly learned she loved drivey dogs, the more challenging the better, and has become an expert working with that personality type. She regularly meets a lot of people who spent some time crying and absolutely loves helping them and their dogs become success stories of happy cohabitation. Sara’s love for animals started at the very young age of seven with a passion for horses, specifically her boy, Rondo. Her work with horses taught her a great deal about recognizing body language and the importance of patience when training any animal. On the weekends, if she wasn’t riding her horses, she was helping her parents at their Shutzhund dog club, learning about competitive obedience, search & rescue, and protection dog work. But even then her first love remained horses and while she knew she wanted to work with animals when she grew up, she was thinking more along the lines of rodeo trick rider or barrel racer. Lucky for us, in her early 20s Sara found herself with a pack of dogs that had a host of behavior problems: the husky that escaped (and taught the others to follow, of course); the puppy who matured and didn’t like other dogs anymore; the one rescued from an abusive situation who was fearful of everything in the whole wide world; and, just for good measure, the one with some human aggression issues. She knew the only choice was to train them if she was going to keep them, and so began her first steps on the path that brought her to High Drive Dog Company. While there were many turns and forks in the road for each of them over the years, Carly and Sara agree the AHA! Moment, the THIS IS IT, came for both of them in 2006 when they first began training with Aimee. It was immediately apparent Aimee’s brain, abilities, and experience were greater than anything either had learned yet and they knew it would be all the difference in the world for their training abilities – and they were not disappointed. High Drive Dog Company is proud to continue this work with Aimee at shelters across the country assisting with her Playing for Life! Seminars – A Training & Behavior Program for Sheltered Dogs featuring Play Groups and focusing on teaching people, really getting them to understand, each dog is an individual regardless of size, shape, gender, breed, or past experiences. And if we can truly know that and apply our experience and expertise rooted in behavioral science, we can help so many dogs in this world. And that’s what drives us every day! Carly started High Drive Dog Company in 2009 and has since taught thousands of dogs and their families in our Colorado communities how to live together better. In 2012 she realized it was time to expand the company, set up a training center, and bring Sara Thompson on board. Carly and Sara are both Professional Members, International Association of Canine Professionals. Carly lives in Longmont with her family, including dogs: Pig, Owen, Catie, Dolly, and Tex; and four absolutely charming mice: Boo, Bean, Snuffleupagus and Little Bear.